The Kickstarter campaign for the Inclusive Press graphic novella, Bingo Love, by Tee “Vixen” Franklin, Jenn St. Onge and Joy San was fully funded in 5 days, and now with just a week to go, is celebrating with new tiers and stretch goals. Backers of this warm-hearted romance about two Queer Black women rediscovering their love for each other after decades apart, can now receive two softcover copies of Bingo Love for a $44 pledge or donate copies to LGBTQ youth centers. Bingo Love is currently over 210% funded and quickly approaching $45k. Once Bingo Love reaches $60k, digital and physical backers will receive a short story, set in the Bingo Love world, written by Gail Simone (Clean Room, Batgirl, Secret Six). "It is not exaggeration to say this [Bingo Love] is absolutely going to be a smash," said Simone. "It's one of the best comics of the year. I ADORE IT TO PIECES." 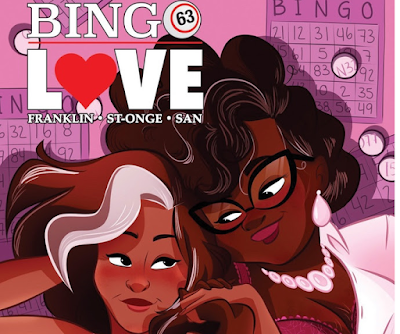 During the third week of the Kickstarter, it was announced that Tee "Vixen" Franklin was the recent recipient of the Queer Press Grant for Bingo Love. The Black Queer romance novella has been featured on Logo's New Now Next, as well as being interviewed for The Huffington Post and The Root. It's no wonder why Bingo Love has over 1,400 backers on this project. There are many other tiers still available for backers, ranging from a $5 pledge for Bingo Love wallpaper art, to options with pledge rewards that include softcover copies with a choice of three variant covers by Genevieve Eft, Nilah Magruder, or Carla “Speed” McNeil; postcards by Shauna Grant, Meredith McClaren, Christina "Steenz" Stewart, and Vicki Tsai; and an enamel pin by Asia Kendrick-Horton. Premiere rewards still available include script reviews by comic book writers Erica Schultz, Al Ewing, or Shawn Pryor; a portfolio review by Dark Horse Comics editor Patrick Thorpe, Skype sessions with Top Cow editor Bryan Edward Hill, writer Steve Orlando, or writer Scott Snyder; and a commission by artist Benjamin Dewey. Bingo Love is an 80-page, full-color graphic novella telling the story of Hazel and Mari, who meet and fall in love as teenagers, separate and lives as wives and mothers, and then find their ways back to each other fifty years later — rekindling a romance that began in a church bingo hall in 1963. The Bingo Love Kickstarter campaign ends on April 17th. Find out more at www.bingolovecomic.net.